Here we are … 14 years down the line and still going strong with a great brand that stands for qualitative and upfront techno music! As it’s our B-day we are treating you to a great line-up with lots of different artists so there will be something for everybody’s taste. Heiko Laux is no stranger to Kozzmozz, he was with us during the first years at Kuipke, revisited us a couple of years ago and now he’s back. And why wouldn’t he be … 5 great albums and a label that’s brought us almost 150 great releases by all the leading underground techno names. Kanzleramt remains at the forefront of the techno scene since 1994, just like us! Another leading name since about 14 years is Dave Summer aka Function. He started producing for Damon Wild and Regis before launching his own label, Infrastructure. His moniker Richard Harvey also made 4 tracks for Richie Hawtins first Decks, XF & 909 compilation. After having been active as a serious party promoter in New York and Detroit, he now moved to Berlin where he’s one of the guys representing the famous Berghain techno sound. Next to these dj-sets, you can also expect two great live-sets. The first coming from Redshape who will be releasing his new album ‘The Dance Paradox’ on Delsin Records around the time of this party. He has been hailed by all the big names in the scene since his first ‘Shapedworld EP’ in 2006. Since then his records can be found on Styrax, Music Man, R&S, … as well as his own label ‘Present Recordings’. He doesn’t like to repeat himself, so every live he does, is different. Second up is Makaton from London who has signed names as Regis and Inigo Kennedy on his Rodz-Konez label. He will bring us a hard and deep live set. Our Belgian guest for the night is Tomaz, he’s been at the forefront of Belgian techno as a dj and radio show host for about 14 years also. 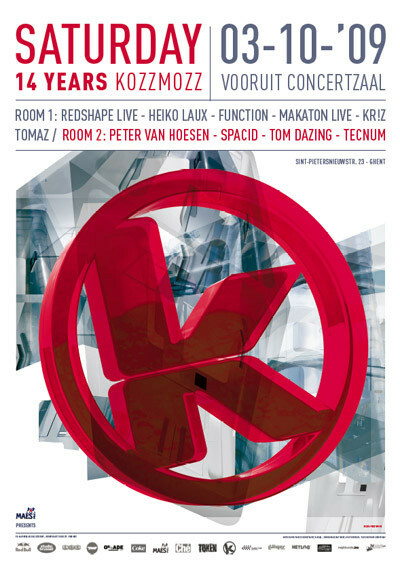 They will all be joined by our resident Kr!z from Token Records. In the Ultra room Peter van Hoesen is our main guest. His name has been popping up more and more as he’s making waves with his ‘Time to Express’ label as well as his many installations. Both have taken him to places as far as Japan and Montreal. Time for Belgium to get to know him a bit better also. He gets the company of Tom Dazing and Tecnum. Both are becoming regulars at Ultra and that wouldn’t be the case if they weren’t really good! And off course, also Ultra resident Spacid will be present with his favourite minimal selection.